Kerckhoff Hall's Grand Salon was nearly half full on May 25 as a representative for Epic Systems walked through the process for how doctors and nurses will view and route the results of patient tests in CareConnect, UCLA's electronic health record system. "What if I only want to see abnormal results? It is possible to separate them from normal results?" "What's the backup system for following up on results in case you're out of the office?" "If I don't get a result within a specified time, can I get an alert?" A lively discussion among some 40 physician and nurse champions, clinical managers, CareConnect "In Basket" project team members, and others continued for nearly an hour. These UCLA Health System faculty and staff were working to validate how closely the workflows in Epic's Model System align with how we do things here. Epic's Model System culls best practices from the hundreds of EHRs the company has developed over the years for many of the country's largest health providers. The company then modified those Model System workflows based on information gained from hundreds of UCLA Health System staff during site visits at the end of April. Now, through a series of validations sessions -- the first round took place May 24-26 -- diverse groups of eventual users will participate in making thousands of decisions to ensure that when CareConnect goes live it will meet our specific needs. 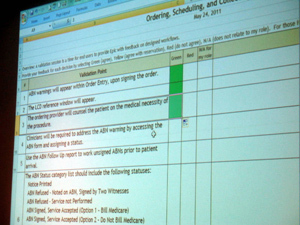 At the end of May, more than 400 faculty and staff took a thorough look at hundreds of clinical and business workflows in 83 validation sessions, ultimately giving a green light to those that would enable staff to do their jobs and holding up red lights to those that needed to go back to the drawing board for revision. By the time discussion about the "Results Routing and Follow Up" workflow wound down in Kerckhoff Hall, the incredible complexity of a seemingly simple process was revealed. The workflow was examined from every conceivable angle, with the experience and smarts of all participants contributing to a comprehensive assessment. In the end, items that require further consideration were listed on a flip-chart "Parking Lot": What's the definition of an authorizing provider, a billing provider, and an encounter provider? ; What's our policy at an organizational level for results routing? ; and a handful more. Two of the five validation points got green-light votes by consensus. Making sure that the workflows in CareConnect enable staff to do their jobs is an iterative process. The three red-lighted validation points will be reviewed again by faculty and staff at a future validation session once the workflows have been modified. CareConnect's Ambulatory Clinical Director Jeanne Markland, who facilitated the discussion, summed up the group's efforts: "There's a beautiful balance here between cognitive thinking and system building." The second round of validations sessions is set for June 14-16. View the Validation 2 schedule. Scroll through a gallery of photos from Validation 1 -- May 24-26, 2011.